Preheat oven to 350 degrees. Lightly spray a 9-inch square cake pan with cooking spray. In a large bowl, stir together cake mixes, eggs, and 1 cup buttermilk until well combined. Spread batter into prepared pan. Bake until a wooden pick inserted in center comes out clean, about 25 minutes. using a fork, poke holes all over top of warm cake. In a medium bowl, whisk together cream of coconut and remaining 1/2 cup buttermilk; slowly pour mixture all over cake, letting it absorb. Cover and refrigerate for at least 2 hours or overnight. 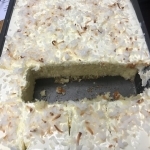 Just before serving, spread whipped topping onto cake, and sprinkle with coconut. Topping: 2 cups of milk and coconut instant pudding.